Here’s the thing, all of us creative types, we just don’t know how the hell to stop. It’s a reflex, a comfort blanket, an obsession, a drive, a best friend, worst enemy, love/hate, do it or die essential and, you know what? Even in the event of a cataclysmic world breakdown, that instinct is unlikely to take a powder and run for the hills. You’re going to have a LOT to say. So how do we go about planning a practical, workable solution to this unavoidable instinct that won’t add a whole bundle of unnecessary crap to your survival bag? Not only that, but this extra piece of kit kind of has to be manual, because there’s no guarantee anything electric is going to work ever again. 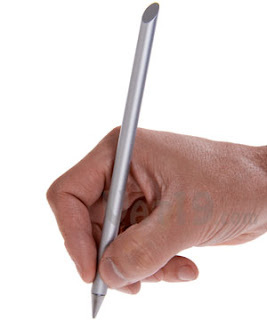 A metal pen – yes, you heard me, a METAL pen. This puppy will write on anything, under any conditions, even under water! Yes, you heard me… under water! I think I’m in love. It’s apparently got endless ink, but I’m a practical sort and my instinct says to buy two or more; because two pens are better than one, and more pens are even better than two, every writer knows that. Now, you may want to grab yourself some paper for this puppy but, like I said, it’ll write on anything and we write to be read, us writing obsessives. In an apocalypse I suspect book sales will go down with civilisation, but those left will hopefully read the words we scrawl upon the walls of abandoned buildings, cracked paving stones, and the smoking hulks of cars. Keep your creativity, your passion for writing the world, never let it die, and leave behind some evidence of your experience for those who come after those who survived. And also smile with smug satisfaction that they will, rather like we do when observing the Mayans, have no idea whatsoever how the hell we managed it!